Minado is a place that I had heard about quite a while ago, back when I was still attending Chinese School. 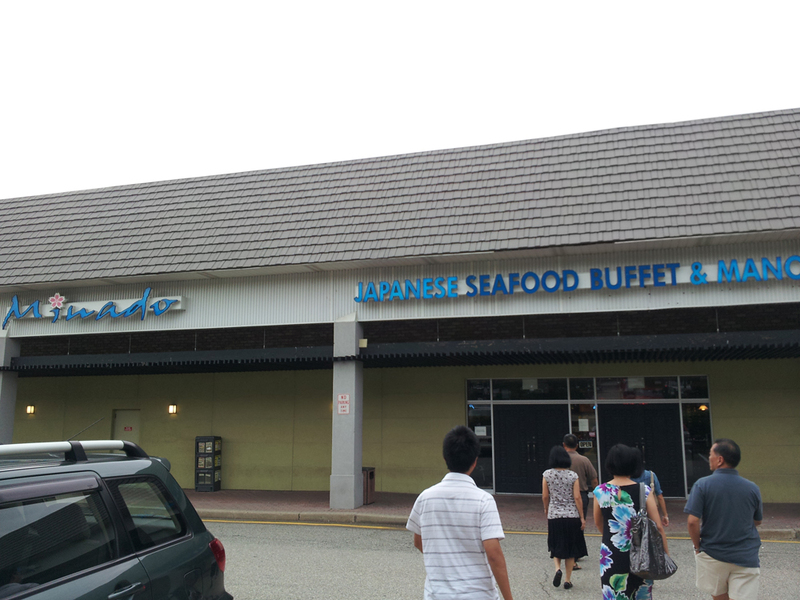 I guess that the concept of a Japanese buffet was still relatively new at the time, and word on the street was that Minado was the best at it. Fast forward seven or eight years, and here we are. 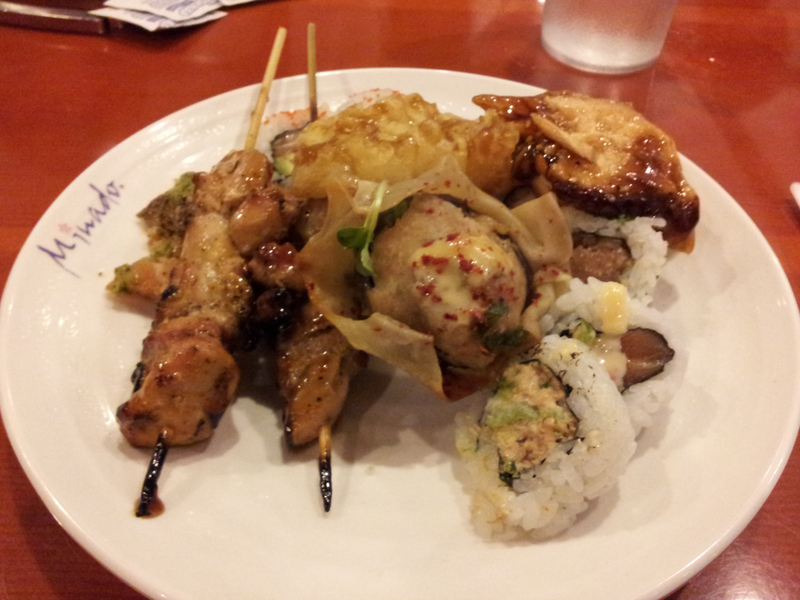 By now, my family has sampled a few Japanese buffets that have cropped up in the area, most recent being IchiUmi in Edison. So after we had heard and read that Minado was still the best Japanese buffet in the area compared to others, the bar was set pretty high. Being located in Morris Plains, Minado is a little over an hour drive from where we live. With that sort of distance away, we wanted to make sure that the trip out would be worth it. We took a visit there tonight, and I have to say that I was kind of underwhelmed after the hype. When you first walk in, it is clear that there are a number of different stations dedicated to various types of Japanese food, ranging from the maki rolls to sashimi to hibachi to the hot foods. The dining area is extremely spacious, and the high ceilings prompted me to wonder if the previous occupier of the space was a storefront of some kind. After being seated, we eagerly decided to hit up the buffet line. I quickly started off with a full plate of the maki rolls, nabbing right around 13 rolls. I was impressed by the number of different maki rolls being offered as I was pondering what to put onto my plate. My next plate had me venturing over into the hot food section, sampling some of the whitefish tempura, hibachi chicken, and the teriyaki salmon. I did also try out some of their salmon tataki, which I found to be very tasty (tataki being a method of preparation where the fish or meat is briefly seared, and then slightly marinated in some vinegar). 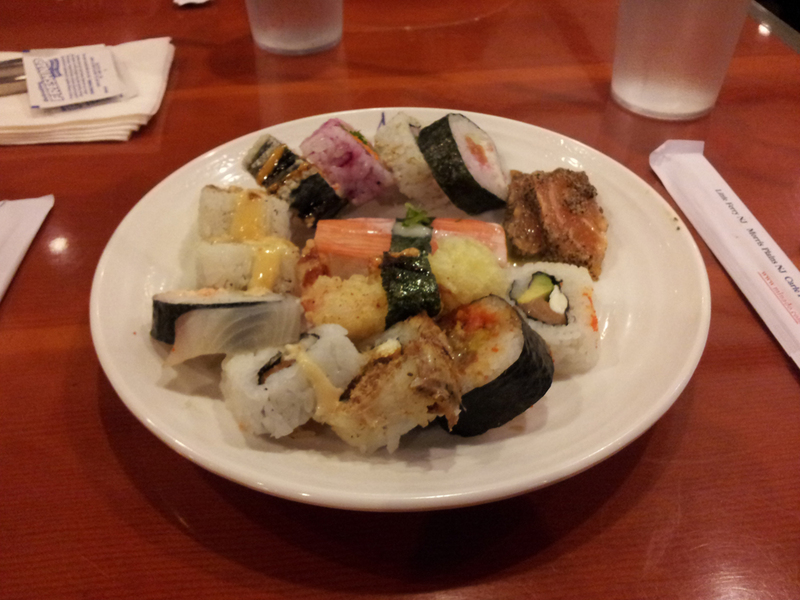 Adding that to some more maki rolls, and I had quite a second plate to finish. My overall impression of the quality of the food was relatively mediocre. Most of the ingredients tasted fresh and there was a nice variety to choose from. However, I had to admit that none of the maki rolls really stood out in terms of flavor profile. Usually at other Japanese buffets, I have had some rolls that really stood out on their own as being those “signature rolls” that you might order at restaurants, really full of robust flavor. If given the option in the future, however, I think I might stick with going to a Japanese buffet closer to my hometown, such as IchiUmi or Sushi Palace. Although there was a good variety to choose from, the overall taste of the maki was relatively bland compared to other places I have been to. 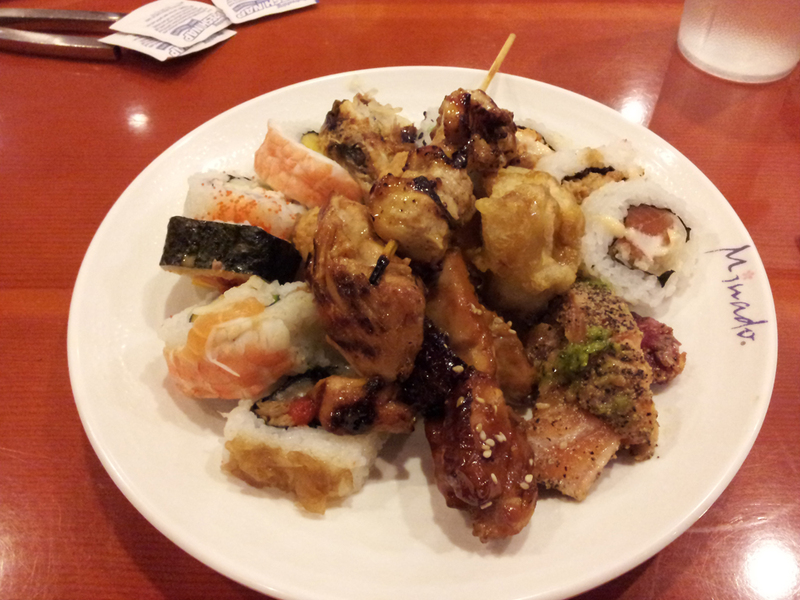 To me, this is one of the prime reasons why I hit up Japanese buffets, and it was kind of a letdown tonight. It was a nice and open atmosphere, with great lighting around the buffet lines. The tables and countertops around the buffet were also kept very clean. Our waitress was always around to refill our cups and take away any empty plates we had on the table. Such attentive service was well appreciated. It is debatable for me if the price of $31 was worth it for the food. If speaking in terms of volume, I definitely ate my share tonight. If speaking in terms of quality, I don’t really feel satisfied with a lack of taste from some of the rolls I sampled tonight.